Daily I marvel at how parents of yesteryear handled having children—especially children with special needs. Through blogs and the Internet, there is a greater understanding of what special needs entail and network of support for parents. Technology has also benefited the children themselves, with all types of advances providing assistance where they need it the most. Communication often can be a struggle for children diagnosed with cerebral palsy. Sometimes getting the most basic messages be a challenge and create frustration for parents and child alike. For children with cerebral palsy (and autism, Downs Syndrome, or other conditions that impair language and verbal communication), a number of applications for tablets and smartphones have been developed with their special needs in mind. Augmentative and alternative communication (AAC) apps helps those struggling with speech to communicate with their parents, teachers, and peers. Children with cerebral palsy can also benefit from other apps that help improve motor control skills. 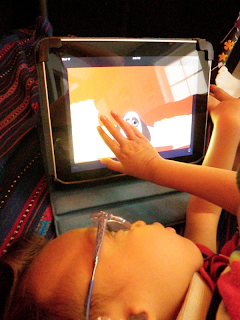 Here are some of the best apps out there for children with cerebral palsy. 1 Proloquo2Go - AssistiveWare One of the highest rated and most popular (and relatively expensive) apps available, this AAC program is highly customizable and can be adjusted to a wide range of users. This text-to-speech program generates speech by tapping buttons with symbols/icons or typing on-screen. It features a range real children’s voices from which to choose, and can be personalized with a combination of icons and photos. 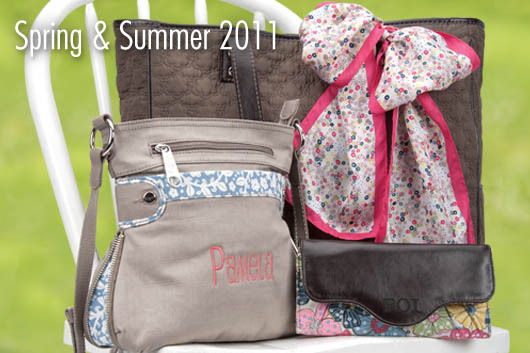 Best of all, this program is easy to customize and personalize on-the-go. Here is a video of the Proloquo2go being used by Max, a nine-year-old-boy diagnosed with cerebral palsy. 2 TapToTalk™ - Assistyx LLC Like Proloquo2go, this is a AAC program. A free application, it offers solid basic text-to-speech needs, but does not have quite the vocabulary or flexibility of its more expensive competitor. However, if you purchase the customizable version, you will be able to add more words and images (including your own photos) as needed. 3 Yes-No - Smarty Ears From the Smarty Ears stable of AAC applications, this basic, quick and easy application only offers a choice between yes and no, but is a great program for non-verbal or pre-verbal children to quickly get across an answer. The two-choice sets can be configured with pictures, audio and text as needed to illustrate the difference between the two choices. 4 iComm - Bappz An excellent AAC application for quick choice-making, iComm comes with a number of pictures and voice recordings of colors, shapes, letters and body parts, with the option of customizing with your own photos and recordings. All the child has to do is select the images that correspond with point they want to communicate and create a short sentence. 5 First Then Visual Schedule - Good Karma Applications, Inc A great tool that helps children to better understand their daily schedule—especially for those with a rigid timetable. Foreknowledge and understanding of next steps can help decrease frustration and anxiety in children, especially with those with limited communication skills or understanding of sequences. A selection of photos and voice prompts (you can record your own) allows you to create custom schedules that walk children through their routines. 6 SpeechBox™ for Speech Therapy (Apraxia, Autism, Down's Syndrome) - iPad Edition - The Jonah Bonah Learning Company An Award Winning iPad app designed for word practice, this easy-to-use program uses simple picture-for-word “flashcards” to help children increase their vocabulary. Not only does the app have over 700 pictures/words, but you can customize by adding your own pictures (including friends and family members) for practice. 7 Dance Party Zoo - FIZZBRAIN LLC A fun way to practice balance, coordination, and rhythm (while engaging children in always needed physical activity), Dance Party Zoo is a dancing game that provides children feedback about how well they did at keeping rhythm via a simple graph. Not only are children able to pick their own zoo animal as an avatar, the after each session, they can watch their avatar replay the dance. 8 Dexteria - Fine Motor Skill Development - BinaryLabs, Inc. A multiple-award winning app, Dexteria is a set of therapeutic hand exercises. 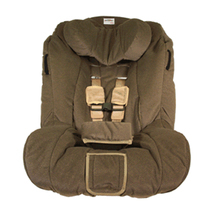 Used on a regular basis, this program can build strength, control, and dexterity. A great program to improve fine motor skills in children’s hands, so as to get their handwriting-ready. Dexteria has an automatic tracking and reporting feature that allows you to monitor progress. 9 Injini: Child Development Game Suite - NCSOFT This collection of learning games target toddlers and preschoolers with cognitive, language, and fine motor delays. Injini entertains and engages children with 10 feature games, 90 puzzles, over 100 illustrations and more, while helping them practice their fine motor and language skills, and improve spatial awareness, memory and visual processing. 10 Zanny—Born to Run. With beautiful illustrations, pictures that move by touch, and an audio narration this interactive app is part of a book series written specifically for children with special needs. While not directly aimed at children with cerebral palsy, the story focuses on acceptance, tolerance and understanding of people who are “different.” This program comes with a game that helps children recognize facial expressions and feelings. And here’s a short bonus list of apps that are not specifically targeted for children with special needs, but are for preschool aged children and so still can be used as great tools for development. 1 iEarnedThat HD - Kidoc, LLC An excellent non-verbal and interactive motivational tool to keep your child working towards a goal. Take any picture of a desired reward and turn it into a 3D interactive jigsaw puzzle (of up to 60 pieces), set the goal and how each puzzle piece is awarded, and encourage your child as they earn their desired prize one piece at a time. 2 iTouchiLearn Life Skills: Morning Routines for Preschool Kids - Staytoooned Teach your child virtual morning routines that can translate into real world activities. Each level is achieved only by completing a unique activity in the prior level; children earn star rewards for successful completing a goal. This interactive program reinforces life skills in a fun, approachable manner. 3 Monkey Preschool Lunchbox - THUP Games A great way to introduce your child to letters, colors, shapes, counting and pattern recognition. 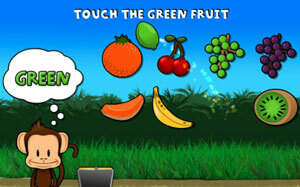 Children earn reward stickers to put on their own virtual canvas board by helping the monkey fill his lunchbox with fruit through solving puzzles and other learning games. Added possible bonus: convincing the picky eater to try eating something that’s featured in the monkey’s lunchbox. is a freelance writer in the Los Angeles area. Her oldest son has cerebral palsy and it was her special needs lawyer that first suggested many of these apps, all of which she now uses on a near-daily basis. Hello my name is Christina Yauch. My daughter, Victoria, was diagnosed with Cri Du Chat Syndrome at a six month well visit in December 2010. Cri Du Chat is a very rare chromosomal anomaly and most doctors have never seen a case of Cri Du Chat. Victoria has been using an iPad since she was about 8 months old. It has been a wonderful experience for the whole family. She uses the iPad to teach basic cause and effect skills and as a motivator during PT and OT sessions. She is also learning communication through choice making apps and the yes/no app. Victoria uses the Talkboard app to let us know she wants to eat or drink. We created a board with a picture of a bowl, a toy, and a photo of herself. If she is hungry, she taps the bowl and it repeats back to her "breakfast" I love the app because it's easy to use and adapt to your child's needs. We use the same app to involve Victoria in repetitive stories. I am also planning on making her a photo album with the entire family's photos using the My Family app. The My Family app allows you to add photos along with a recording of the name of the person in the picture. She can tap the photo to move through the album. Baby Rattle Toy - SelenaSoft, Inc.
We have been devastated, humbled, and blessed since her diagnosis. Victoria is a beautiful, happy baby who lights up the room with her smile and giggles. She has taught everyone around her more in her short life of 20 months than most will teach their entire lives. She continues to progress and surprise us every day. Through her hard work and the hard work of her phenomenal therapists, Victoria is already surprising the medical community with her accomplishments. She is absolutely amazing and makes an impact on everyone who meets her. To learn more about Cri Du Chat Syndrome, please visit www.fivepminus.org . So exited to report that Little Bear Sees has done it again with a new app My Talking Picture Board - Little Bear Sees for our kiddos with CVI. Check it out!!!! If you are not familiar with Little Bears Sees then please check out their website http://www.littlebearsees.org/ . 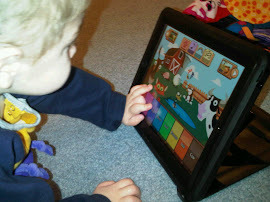 As far as I know they are the only organization making apps for our little ones with CVI. Their original Tap-n-See Zoo - Little Bear Sees is still one of my favorites for our young ones with cortical vision impairment. I was able to purchase a first generation refurbished iPad to give away. The application has been updated. Please print off and mail to address provided. The grants from now on will be for babies up to age 8 only. The deserving child must have multiple medical and/or developmental issues (physical and/or cognitive impairments) that impact his or her ability to play and communicate. This grant cycle runs from today til May 8, 2012 at 4:00 PM. The committee will meet and make the decision within 7 to 10 days and we will contact the deserving child's family and mail the iPad out immediately. Thanks. 4. Baby Rattle Toy - SelenaSoft, Inc. These are probably the apps I go to most for infants and toddlers in late phase 1 and phase 2. I have other suggestions for children in phase 3. For infants and toddlers in early phase 1 I typically only use the free lightbox type apps along with the free flashlights. Hope this helps and would love your suggestions. I just purchased the next iPad for a deserving 13 to 18 year old with multiple medical and/or developmental issues that resides in the US. The deadline is September 13, 2011 at 4 pm and the iPad will be granted the next week. Please spread the word. Using TapSpeak Sequence A is able to spell his name. I think he looks so proud at the end!!!! Thanks Austin and Austin's Mom. Hope the waterproof case works out well for you!!! Congrats. Have you ever had a hunch about something that could turn out to be a spectacularly expensive flop or a priceless investment? 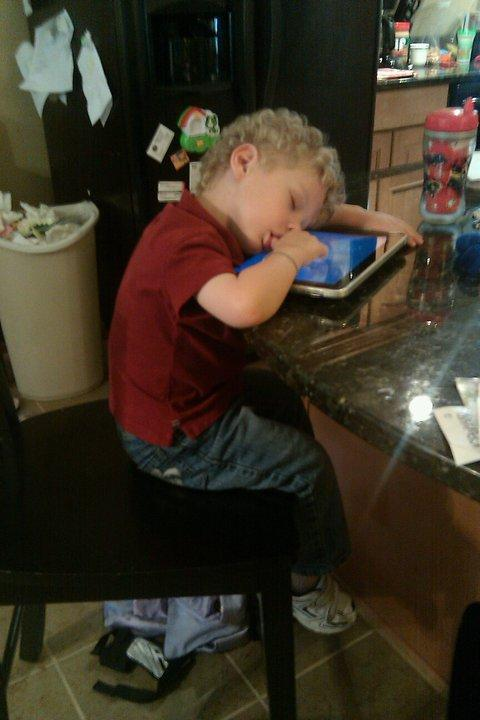 Here, I am not talking about the stock market -I am talking about buying an iPad for a three-year-old. My son Aiden, has classic autism and is nonverbal (I prefer the term 'pre-verbal', because I know the words are coming) and in January of this year I had a hunch. He had started a special education class after a full year of intense speech therapy and constant work at home. Things were clicking in my head...he responds so well to vertical presentation, he repeats phrases more often from repetition like from the television, bright colors and movement engage him.. then I saw him interact with the adapted pc in the classroom and wanted one for our house. There were some problems with that idea because putting any three-year-old in front of a pc is risky anyway, nevermind the autism. Should I get an old pc and buy a touchscreen ?...and then the software...and then set it up in a place he wouldn't knock it down...and do all games work with the adaptive touchscreen? and, and, and well, I think you get the idea. This is when I started to hear about iPads. *hunch time* An iPad might end up costing a similar amount of money and I couldn't spend that much on a hunch unless I found a way to get the money without taking away from my other two children. So I sold necklaces. Someone decided that I had a great hunch (or I make lousy necklaces) and gave him an iPad. Pressure time. 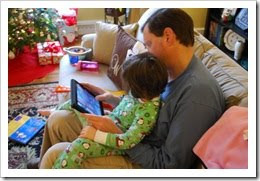 It's one thing to have this hunch fail after I purchased an iPad -after all, we are a family of five -someone would put it to use, but I found myself anxious over such a gift. Someone trusted my hunch and spent a nice chunk of money on that hunch. I worried for nothing. From the moment my son held that gift, things have not been the same here. It was an immediate love that hasn't dulled since he got it in February. From the moment he started to maneuver its screens I was shocked at his abilities. His movements were slow and jerky at first (thanks to delayed fine-motor functions) but you should see him now! He stays on task. He has an impressive memory that he flaunts in memory games. He puts puzzles together on screen that I never could have gotten him to do sitting on the floor before! He is spelling words! The most impressive thing? He is speaking more and doing it appropriately. He also looks at people while he is playing to see if they are watching him accomplish a task or if they are as happy about a book as he is! Self-esteem is nothing to be ignored and I believe conquering these puzzles and strutting his cognitive self has spilled over into his daily interactions. Some of you may be wondering if all of these new skills are only exhibited while he is using his iPad. The answer is: nope. He drew his first face for me on paper (complete with eyes and mouth) three weeks ago. He says words to get what he wants and if he can't recall the word, he pulls from his list of memorized phrases, and if he is just too excited to recall his words, he leads me by the hand and places it on the desired object. Today, he sat in front of his iPad with a Sprout app clip of Nina and Star doing a clay leaf craft. He took me to the Playdoh and led me back to the counter where he verbally explained the steps needed for us to make leaves together. 1. I Love You Through and Through (Scholastic) Nothing sweeter than seeing Aiden perform this book while the story is being read. 2. The Monster at the End of this Book (Sesame Street) Who doesn't love Grover?? A great book that has cause and effect value as well as highlighting each word defining word and sentence structure. 3. Little Bella's -I Close My Eyes (Tui Studios) This is the book that Aiden fell in love with first. Breathtakingly beautiful, she will draw everyone into her love of imagination. 4. Bob Books #1 Reading Magic (Learning Touch) Want help teach letters? How about phonics? Maybe story progression? Hands down, one of the best, most interactive learning books available. 5. Winnie the Pooh -What's a Bear to do? Puzzle book (Disney) Pooh needs honey for his pots and my son gets to solve puzzles and hear an adorable and very simple story. 6. ABA Receptive Identifications by Function (Kindergarten.com) All of Kindergarten.com's apps get a high rating from Aiden and me. No, I'm not listing this to make me look good, my son actually adores this app. Making choices by function is difficult for people on the spectrum and it's easy to understand why; If you are given the task of picking the object that you carry and are given the choices of an apple, a clock, and a book bag, your inner test-taker will pick the book bag, but that choice is not so easy for a literal mind who clearly sees that all can be carried...this app helps make the distinctions. 7. Monkey Preschool Lunchbox (Thup games) Puzzles, matching, letters, stickers and an adorable monkey. 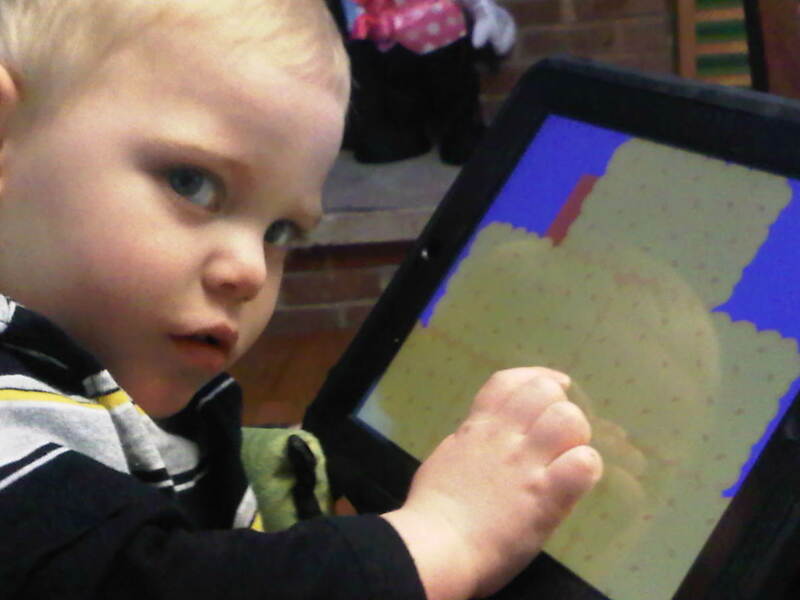 This was Aiden's very first app and still in his top ten. 8. Nick Jr.'s A to Z with Moose and Zee (Nickelodeon) Find the letters and have fun! 9. Sprout Player (PBS) I had a strict "No video" rule for the iPad, but gave this a shot because I heard so much buzz... This is wonderful for my son. He can back up the clips at-will and review words as many times as need until a "click" happens. Very well made and has not turned into a fixation for my son. 10. ABC Expedition (Meldmedia Inc) There are a ton of ABC apps on Aiden's iPad (generalization!!) and this is so clear and adorable with a bonus side of entertaining. Free Codes to redeem from our friends at SoftwareSmoothie. Please leave a comment about which code you took and also pay a visit to Software Smoothie's Facebook page and leave a comment there about how you like the game. S loves to hear Taylor Swift sing so using ChoiceBoard Maker app S can chose to hear his favorite singer/blonde. If anyone is interested in Thirty-One Products all profits from purchases will go to the Babies with iPads grants. So browse our catalog and submit your orders to the linked website and 100% of all commissions will go towards our grant. Happy Shopping. Update from his mom: The first time he was excited, yet very frustrated, like he really wanted to play it but wasn't quite sure how. Within a couple more sessions he has really gotten the hang of it and now gets excited each time. He has quickly learned to turn the pages of the book app I got him--The Monster at the End of This Book (for iPad) - Sesame Street. 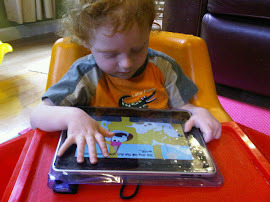 It is a great app for him to understand the concept of turning pages (on the iPad). This photo series is of him engaging with the "Grover" book and then also of him playing the piano (this session of working with the iPad lasted about an hour!!!). You can see in the last few photos he really starts to get into playing the piano. I would take a turn and then he would take a turn. This was incredible. I really feel like it's the first time in his life that he has been able to express himself through an object. Soliz is very social and engages with people and kids (and dogs too) but he has never, until now, engaged with a "thing". We are taking it slow so he can continue to enjoy and improve his motor skills and eventually use the iPad as a way to communicate. I already see great improvement in his motor skills--also when he is not using the iPad. I will try to send frequent updates. I thank you again for giving Soliz the awesome opportunity. Article in national magazine iPhone Life. Babies with iPads mentioned along with other websites.